When it comes to Mexican food in the fast-food arena, there is one king, Taco Bell. Based out of Irvine, California, Taco Bell is actually a Tex-Mex restaurant, something that most likely could’ve made this list in and of itself. 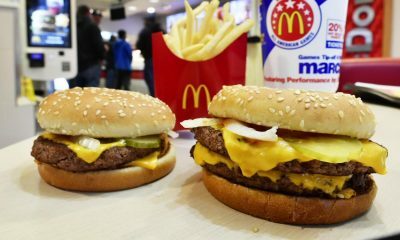 The history of this late night spot is a rich and interesting one and could actually be one of the more interesting background stories of any fast food giant (take that, Michael Keaton!). So let’s delve into the history of the largest purveyor of tacos and burritos in the Western world and find out just what where Taco Bell came from and what it’s hiding behind or inside that bell! Taco Bell’s logo is and has been some variation of a bell and because of that and it’s near omnipresence in every city, suburb, exurb or truck stop, the name itself basically lost meaning like when we talk about Target (despite its logo being a Target) or perhaps more ironically, K-Mart (what’s that K mean? The Thousands of Dollars it loses a minute?). The bell itself doesn’t actually represent some sort of delicious bell-shaped taco, but rather it’s the last name of the man who founded Taco Bell. Glen Bell, like many fast food founders, started in the hot dog stand game. His first was a hot-dog stand/drive-in in San Bernardino, California a couple years after the end of WWII when the population and economy in the United States were quite literally booming. At only 25 years old he opened another restaurant titled ‘Bell’s Hamburgers and Hot Dogs’, in a long story short version of his biography he got into the Mexican/Tex-Mex game a few years later in late 1951 or early 1952 when he opened a taco stand under the name ‘Taco-tia’. That evolved into ‘El Taco’ with a partner, who bought him out, which lead Bell to open the first Taco Bell in Downey, California. Have you ever noticed that you can only get Pepsi products at Taco Bell? 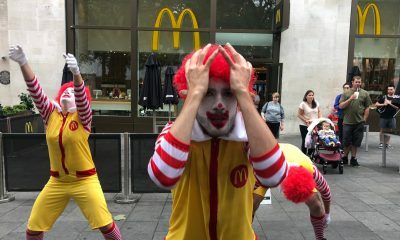 That’s not a coincidence or even a multi-million dollar agreement like most fast food joints have with their pop provider (that’s right, we said pop!). The reason why Taco Bell is all about Pepsi, and especially Mountain Dew and all the exclusive flavors they come up with just for Taco Bell, is that Pepsi actually OWNS Taco Bell. 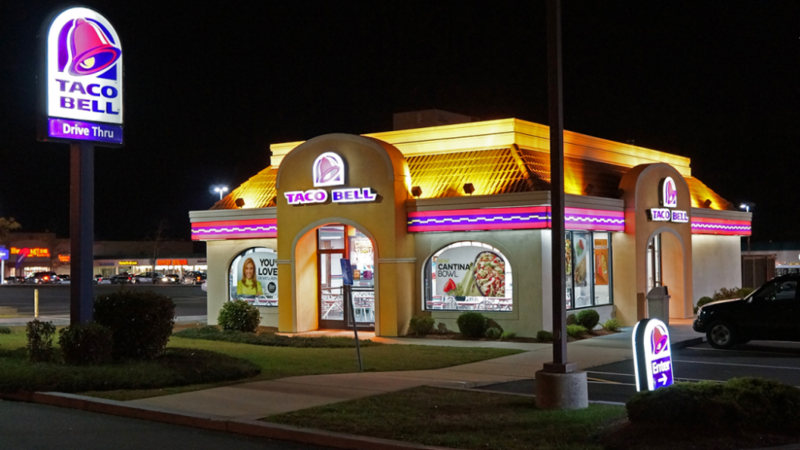 Back in 1978, owner Glen Bell sold Taco Bell to PepsiCo. They stayed in their original headquarters for almost 40-years, though, only moving to bigger and better digs in November of 2015, moving their HQ from Downey, California to Irvine, California. 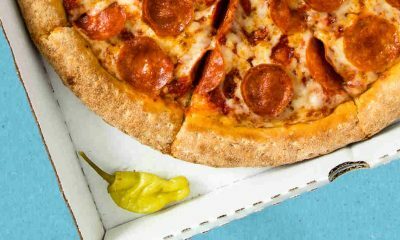 In 1997 PepsiCo actually “spun off” it’s fast-food and created Tricon Global Restaurants. From there, in 2002, Tricon acquired another fast food/restaurant company named Yorkshire and decided to rebrand itself as Yum! 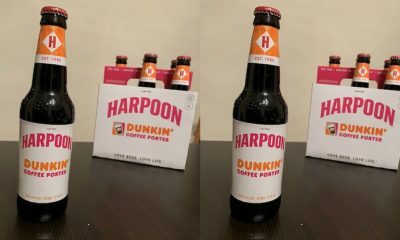 Brands (with an exclamation point after the ‘Yum’… Imagine that poor receptionist having to answer the phone while screaming as politely as possible… “YUM! brands how can I help you?”). Since Pepsi is still technically the owner of Yum!, Taco Bell locations still exclusively serve Pepsi products. Perhaps unsurprisingly, people didn’t really know what to make of Mexican or Tex-Mex food back in the late 1940’s and early 1950’s. 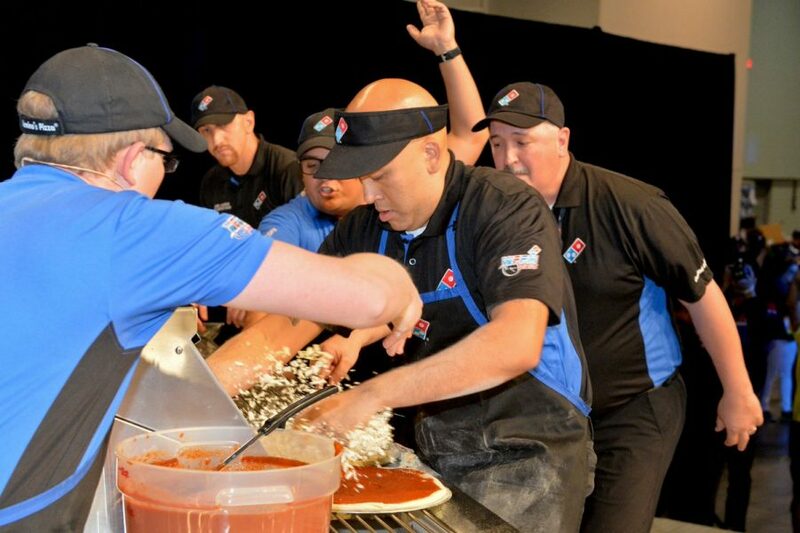 Keep in mind that this was also a time that people were introduced to pizza, as some of the soldiers who fought for the good guys during World War II ended up in Italy (thanks to Hitler jr. Mussolini, the man who actually founded and coined Fascism) and discovered the deliciousness that was pizza and brought it back to the states after defeating Mussolini, Hitler and the Emperor of Japan. Tacos didn’t require any war to end up in front of American’s/people in North America, but they were just as alien to a lot of people (let’s face it, we’re talking about white people here). The idea was so foreign that people didn’t even know how to pronounce “Taco”, instead they pronounced it as “Tay-Kohs”, something that really doesn’t make any sense as phonetically “Taco” makes a lot more sense than “Tay-Koh”, you know, because there’s no ‘Y’ or ‘H’ in “Taco”. Sigh. White people. Either way, people loved the “Tay-Kohs” and bought them en masse, the fact that they only cost 19 cents a pop at Taco Bell founder Glen Bell’s first taco stand. 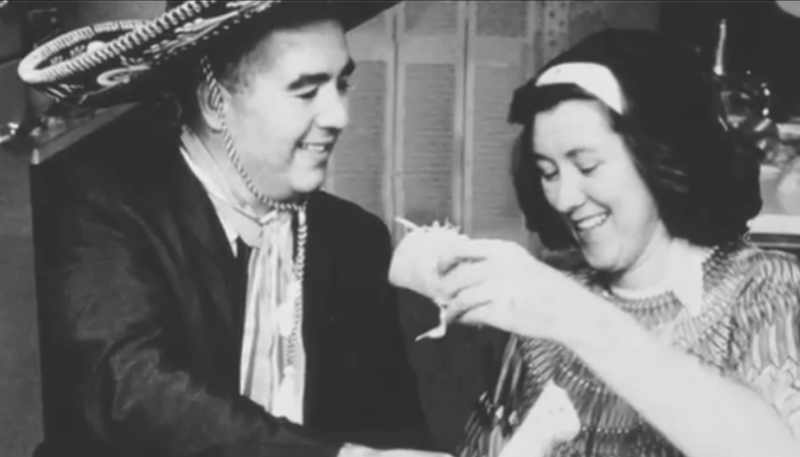 The first Taco Bell finally opened in 1962, after founder Glen Bell learned the ropes by owning a taco stand as well as multiple Mexican restaurants (named ‘El Taco’). 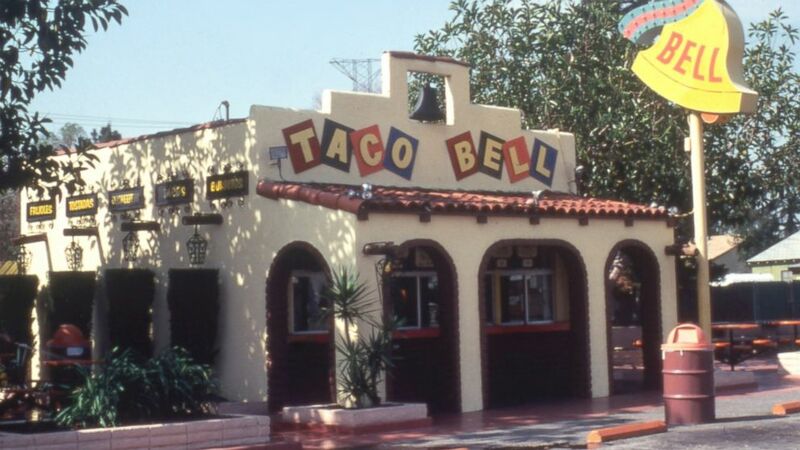 The first Taco Bell looked nothing like the Taco Bell’s of today, in basically every way possible. 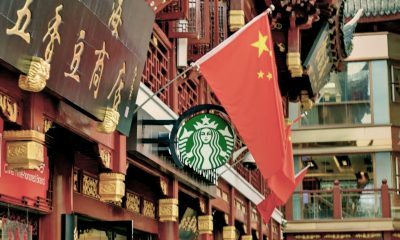 For starters, the store was 400-square feet (which is tiny compared to the average Taco Bell of today which is typically anywhere between 1,800 and 2,200 square feet). The building was described as being “Mission-style”, which means it looked like a stereotypical Mexican building, or at least what a lazy architect with limited amounts of wood (considering it’s size) would think looks “Mexican”. The original location didn’t have any indoor seating or a drive-thru, instead, it only had a kitchen and an ordering window (with the kitchen obviously taking up most of the 400 square feet). There was seating outdoors, though, which was comprised of a few patio chairs and tables, and a fire pit. Bell would hire a mariachi band from time to time to really hammer home to people that they were eating tacos, I guess. If you ask anyone what the original logo for Taco Bell was they’d probably point to the 80’s to early 90’s logo that basically just had a yellow bell in front of an orange/yellow background with the words ‘Taco Bell’ beneath it (and typically the words ‘Drive Thru’ beneath that). That was actually not the original logo, however, not even close as it was actually the fourth version of the logo. The original logo is actually sort of hard to find online, which makes you wonder what the people at Taco Bell are hiding. Luckily for everyone, there are descriptions available online as to what the logo looked like and it sounds… Just awful. The original logo was very colorful and also lopsided. You can find part of it online, the part that spells out “Taco Bell’ with each letter having its own square and lopsided background. Beyond that, or rather ABOVE that, there was also a drawing of a man sleeping under a giant sombrero while sitting on top of a bell. That was quickly replaced by PepsiCo when they took over as they knew the number one rule for creating a logo which is to make it as simple as possible, or at least, not super busy. Having each letter turned a different way, with different colors, and then also having a sleeping man under a sombrero (which is a stereotype that is pretty racist) who also happens to be on top of a bell, is clearly too busy and is probably why they scrubbed it from the internet. If you were lucky enough to be alive in the early 90’s, or at least somewhat sentient, you might remember the promotion that Taco Bell ran at the time as it was advertised on television, the radio and billboards like crazy. 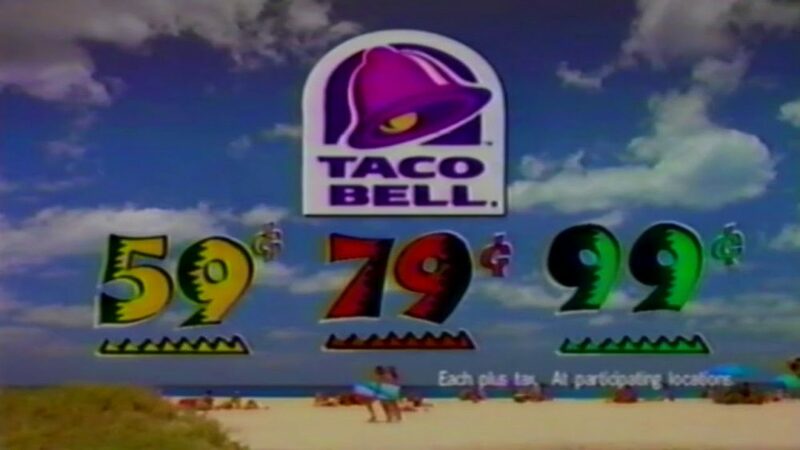 That promotion was the 59-79-99 “value” promotion and the numbers weren’t the combination for the safe at Taco Bell’s headquarters, but rather was something that makes dollar menus look overpriced and greedy. Those numbers were a reference to the value menu at Taco Bell with each number referencing a price point. That means that Taco Bell offered a super wide range of options from tacos to nachos, cinnamon twists to more tacos at either 59 cents, 79 cents or 99 cents. 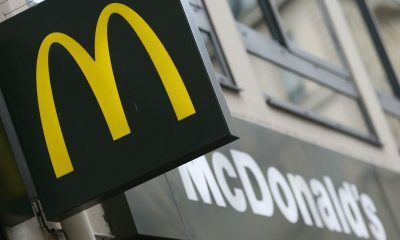 Beginning in 1991, the campaign was not only heavily advertised but it was also a gigantic success in that it increased same-store sales at Taco Bell restaurants by 60 percent, which helped Taco Bell become the “top-performing fast-food company in the Nation” at the time (according to Harvard Business Review). Beyond that, as well, the promotion put a ton of pressure on Taco Bell’s competition and because of that, you could say that the 59-79-99 promotion basically created the dollar menu at most burger chains. Not too shabby for what once was a “Tay-Koh” stand. After the success of the 59-79-99 promotion, sales began to stagnate at Taco Bell. Because of that they decided to come up with a can’t miss advertising concept and you’d think, if you were alive at the time, that they hit a home run with their ‘Yo Quiero, Taco Bell’ commercials. 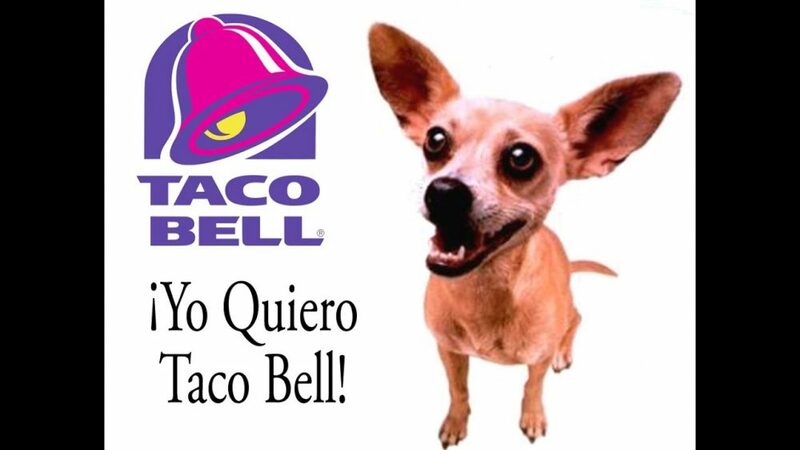 Those commercials starred a Chihuahua named Gidget, who was actually a female (despite having a male voice in the commercials), whose catch-phrase was Spanish for “I want Taco Bell”. Those ads became a cultural phenomenon and you’d think that that’d translate into monster sales for Taco Bell as those ads, along with their follow-ups (the less popular “Viva Gordita and “Drop the Chalupa” spots), seemed to be everywhere. However, despite the fact that you couldn’t go anywhere without hearing someone with no personality of their own spouting “Yo Quiero Taco Bell”, those ads didn’t translate into an uptick in sales for Taco Bell. 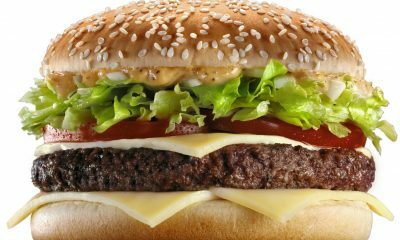 Beyond that, Taco Bell was sued in 2003 by two advertising agency executives who claimed that they came up with the concept for the ads. Taco Bell ended up settling that lawsuit, which was filed in court and asked for $42 million dollars, which means that those ads ended up most likely losing Taco Bell money. Gidget, however, ended up starring in a movie (Legally Blonde 2 with Reese Witherspoon) and lived a full life until she passed away at the age of 15. Multiple cartoons have had a plot in which a businessman or supervillain wants to put their logo on the moon in what would be the best advertising of all-time (despite the backlash that’d come from it and also the potential changes to the tides it’d produce). 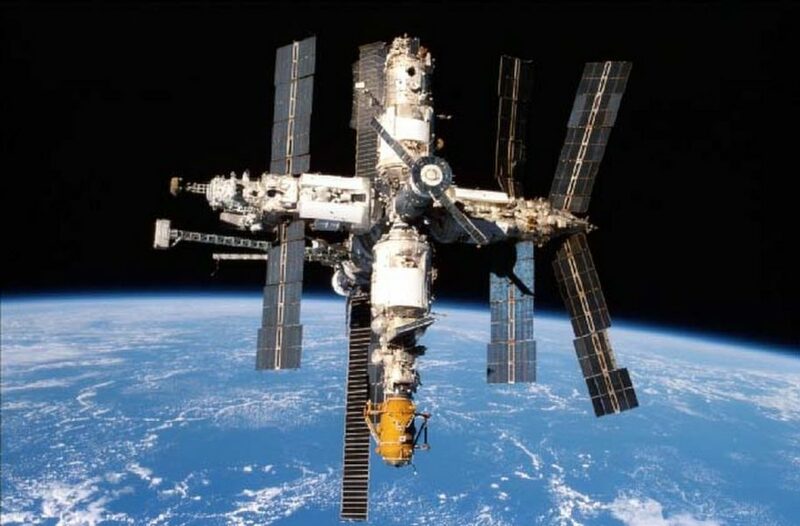 While Taco Bell hasn’t gone that far, they did actually work with Russia back in 2001, to take advantage of the fact that the Russian space station, Mir, was going to be “brought down” after 15 years orbiting the earth. The problem with “bringing down” a space station like that, as we recently found out with China’s doomed space station, Tiangong-1, is that it’s hard to really control or figure out where that space station is actually going to “land” (and by land we mean crash to earth at insane speeds). Taco Bell took advantage of this uncertainty in what is admittedly an amazing promotion, a promotion in which they offered everyone in America a free taco if the Mir space station ended up landing on a giant floating bullseye that they placed in the South Pacific not too far off the coast of Australia. Now, the odds of the space station actually hitting the target was worse than someone winning the Powerball while getting hit by lightning, but the publicity that came from the promotion would’ve covered the cost for the 250-million people that lived in the United States at the time. Of course, Mir didn’t end up coming close to the target, but it does make you think how they would’ve been able to figure out how each person already had their taco unless they were planning on sending out coupons to each home or having Mir drop coupons while it passed over North America. Unfortunately, we’ll never know. Taco Bell’s parent company Yum! 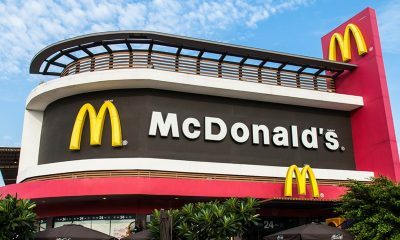 Brands are one of the largest fast food restaurants in the world based on “system units”, as it has over 45,000 restaurants around the world between the almost 1,500 that they own directly and the 43,603 they have franchised. While not all of those locations are Taco Bell’s, a lot of them are and they are based all over the world, bringing “Mexican” food to people in places like the Middle East, Asia, Iceland and Russia (and their space stations, apparently). If you’ve ever been to Mexico or eaten at a traditional Mexican restaurant this won’t come as any surprise but the one market that Taco Bell has had the most problem cracking is actually Mexico. Yum! opened their first location in Mexico back in 1992 in Mexico City, which is one of the biggest cities in the world and would, you’d think, literally eat up what Taco Bell has/had to offer. 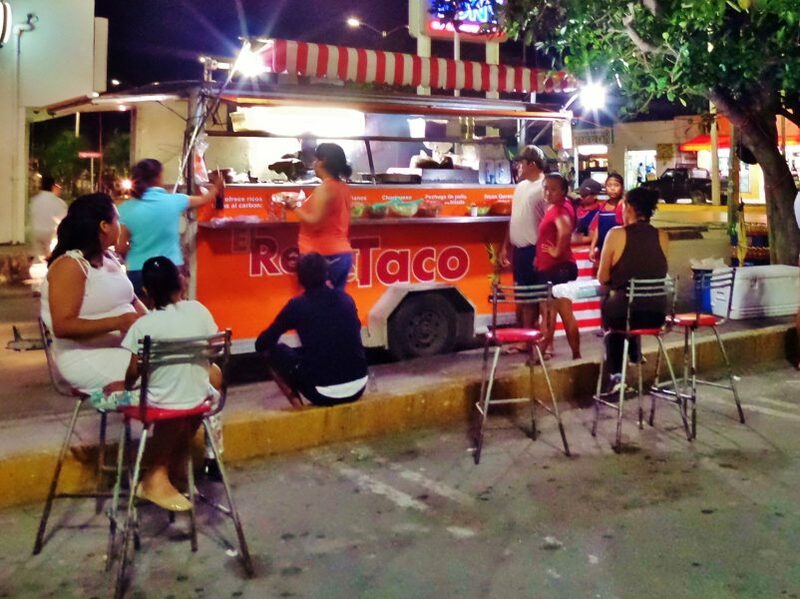 However, that location closed in under two years thanks to poor sales and it took a full decade-and-a-half for them to try again in Mexico, opening a location in Monterrey in 2007. That restaurant didn’t fare much better and again, it really isn’t that much of a surprise as Taco Bell is at best “Tex-Mex”, which is just a lazy way of saying that it’s Americanized Mexican food. Mexican tacos, for example, are mostly meat, cilantro and onions. Things like tomatoes, cheese and especially sour cream are considered “American style” tacos, so, bringing Taco Bell to Mexico would be like a Mexican restaurant opening a Hamburger franchise in the United States that puts celery on its burgers. 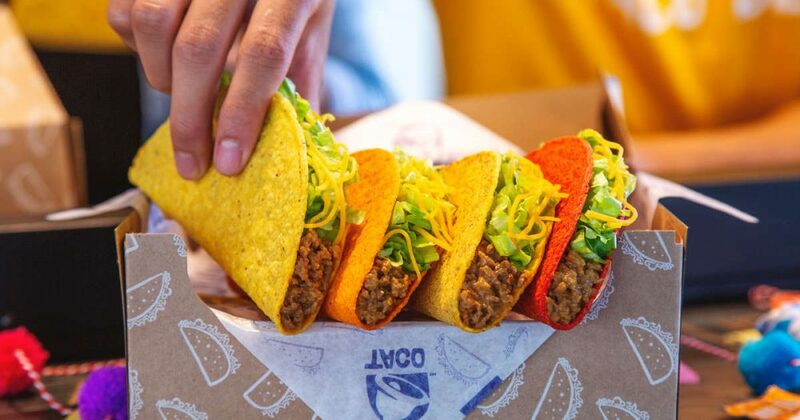 One of the most popular items that Taco Bell has ever introduced is the Dorito’s Loco Taco, a concoction that substitutes the typical taco shell with one that is made solely of Doritos chips. While you’d think that it’d be easy to convert Doritos, which are chips, into a taco shell (which are basically chips themselves). However, Doritos chips are actually a lot different than taco shells in terms of how they’re made and how structurally sound they are and because of that Taco Bell had a hell of a time actually making this idea work. 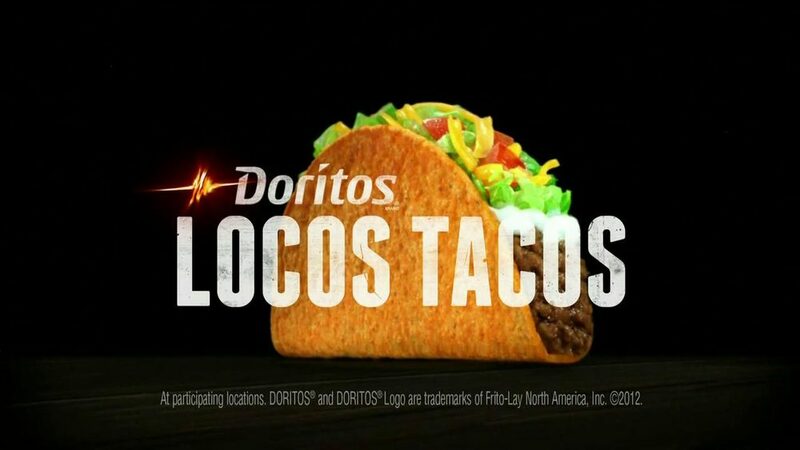 It actually took over two years and over 40 different recipes for them to perfect the science behind the Dorito’s Loco Taco shell, a struggle that was summed up by Steve Gomez, who is a “food innovation expert” at Taco Bell. He said that they had a team of engineers working “day and night” to get just the seasoning right, let alone somehow converting a typical shell into one that looked and tasted like the most iconic chips in the game. The hard work paid off as Taco Bell has reportedly sold more than half a BILLION Dorito’s Locos Tacos since they debuted back in 2012, not including the Doritos Cool Ranch Taco, which surpassed the Hoover Dam as the most deadly engineering project in the history of the United States. Okay, we made that last part up, but can you blame us? Yo Quiero, Taco Bell! Yum! Indeed.